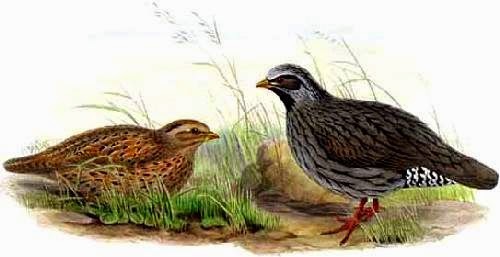 Home › Tibetan-partridge › Himalayan quail - Ophrysia superciliosa. The Himalayan quail (Ophrysia superciliosa) belongs to quails in the pheasant family Phasianidae. These species were known to occur in western Himalayas in Uttarakhand, north-west India. Last known verifiable record was in 1876 near the hill station of Mussoorie. Unverified recent sightings are in Suwakholi and around Naini Tal. Probably the bird is extinct. The International Union for Conservation of Nature (IUCN) had categorized and evaluated these bird species and had listed them as of "Critically Endangered". As per the latest release, this species has now been moved to "extinct" category in latest Red List by IUCN. These birds were 25 cm in length. The Himalayan quail had a red bill and red legs. Their distinctive mark was the white patch before and after the eye. They inhabited steep hillsides covered with scrub. They were recorded to feed on seeds, berries and insects. They used to move in small coveys of six to ten birds. Current topic in Birds of India: Himalayan quail - Ophrysia superciliosa.